The company says it will soon launch a new line of SD cards and accompanying software that will allow laptop users to carry their backups along with them while on the move. The solution is meant to take advantage of the memory card slots that are increasingly standard on portable computers, but are rarely used other than for transferring data from digital cameras or camcorders. Like other backup solutions, Sony's software allows the user to designate folders and specific files to be backed up, either when they are modified or on a schedule. The backups are encrypted using AES 256-bit, and the cards also require a password for access. The company's new "Real-time Backup Utility" software works only with its memory cards, but it is allowing trial downloads that work for 30 days with cards from other companies. Sony announced the product on Thursday, and said it will be available in Japan from August 20 in 16GB, 32GB, and 64GB versions. The backup software will initially support only Windows-based machines. The cards are rated Class 4 speed, a standard that provides write speeds of at least 4MBps. The company is still considering if and when it will launch outside of Japan, a spokeswoman said. The largest 64GB version will cost around ¥14,000 ($140). That is about the three times the current price of a blank 64GB SD memory card with similar specifications. 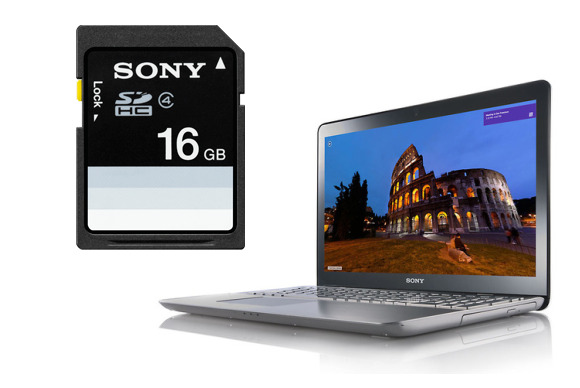 The software on the Sony cards also takes up about 10 percent of the space: the 64GB card provides about 57.6GB for user storage. Developers have created versions of complete operating systems that can run off of SD cards or USB thumb drives, including versions of Debian Linux.